Natalie Coulter, Tweening the Girl: The Crsytallization of the Tween Market (Peter Lang: Mediated Youth Series, 2014). In 1961, as the UN launched its Decade of Development and President Kennedy established the Peace Corps, Canadian University Service Overseas (CUSO) became the first Canadian NGO to undertake development work from a secular stance and in a context of rapid decolonization. Over the next twenty-five years, nine thousand volunteers, many of them women, travelled to more than forty countries, where they became the face of Canada in the Global South. Drawing on more than one hundred interviews, Ruth Compton Brouwer offers a balanced portrait of a group of young Canadians who quickly lost their initial naïveté as they confronted the complexities of "underdevelopment." It was a case, one wrote, of "gnat against elephant." Nevertheless, the volunteers sought to fit into the host communities that had invited them and to provide needed social services, particularly in education. They returned home confirmed transnationalists. As CUSO alumni, they continued to be engaged global citizens, bringing a new level of global consciousness and cultural diversity to Canadian society, whether as activists in their home communities, radicals in development education, or as part of the extensive "CUSO mafia" in the Canadian International Development Agency (CIDA) and other development organizations. 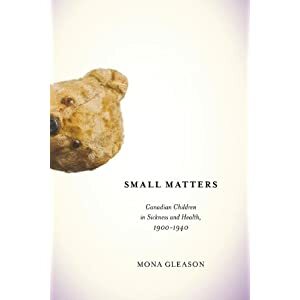 In Small Matters, Mona Gleason explores how medical professionals, lay practitioners, and parents understood young patients and how children responded. During the first half of the twentieth century, particularly in the interwar decades, a number of changes took shape within the field of child healthcare - the rise of pediatrics as a medical profession, efforts to ameliorate maternal and infant mortality rates, and the shift of focus from controlling contagious diseases to the prevention of illness. Gleason makes use of oral histories throughout this period of health and welfare reform to shed new light on children's attitudes toward their medical treatment, their largely unexplored experiences of hospitalization and disability, and the importance of teachers and health curriculum to the development of "healthy habits." 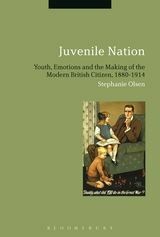 Through juvenile literature and an increasingly influential science of adolescence, Juvenile Nation explores the themes of loyalty, character, temperance, manliness, fatherhood, and religion. In the context of a widespread consensus on the ways to make men out of boys, an informal curriculum of emotional control, key to shaping the future citizenry of Britain and the Empire, is revealed. Ontario Boys explores the preoccupation with boyhood in Ontario during the immediate postwar period, 1945–1960. It argues that a traditional version of boyhood was being rejuvenated in response to a population fraught with uncertainty, and suffering from insecurity, instability, and gender anxiety brought on by depression-era and wartime disruptions in marital, familial, and labour relations, as well as mass migration, rapid postwar economic changes, the emergence of the Cold War, and the looming threat of atomic annihilation. In this sociopolitical and cultural context, concerned adults began to cast the fate of the postwar world onto children, in particular boys. The phrase "child labour" carries negative undertones in today's society. However, only a century ago on the Canadian Prairies, youngsters laboured alongside their parents' working the land, cleaning stovepipes, and chopping wood. 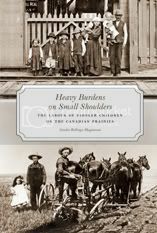 By shouldering their share of the chores, these children learned the domestic and manual labour skills needed for life on a Prairie family farm. Rollings-Magnusson uses historic research, photographs, and personal anecdotes to describe the kinds of work performed by children and how each task fit into the family economy. This book is a vital contribution to western Canadian history as well as family and gender studies. Sarah Glassford and Amy Shaw, eds. 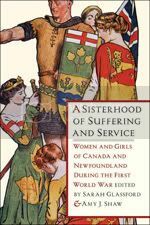 A Sisterhood of Suffering and Service Women and Girls of Canada and Newfoundland during the First World War (Vancouver: UBC Press, 2012). A Sisterhood of Suffering and Service actively engages in redressing that absence and in exploring why the retelling of women’s stories meets such resistance. Drawing upon a multidisciplinary spectrum of recent work -- studies on mobilizing women, paid and volunteer employment at home and overseas, grief, childhood, family life, and literary representations -- this collection brings Canadian and Newfoundland women and girls into the history of the First World War and marks their place in the narrative of national transformation. 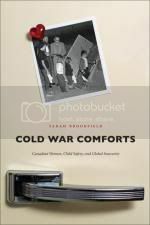 Tarah Brookfield, Cold War Comforts: Canadian Women, Child Safety, and Global Insecurity (Waterloo: WLU Press, 2012). Cold War Comforts examines Canadian women’s efforts to protect children’s health and safety between the dropping of the first atomic bomb in Hiroshima in 1945 and the end of the Vietnam War in 1975. Amid this global insecurity, many women participated in civil defence or joined the disarmament movement as means to protect their families from the consequences of nuclear war. To help children affected by conflicts in Europe and Asia, women also organized foreign relief and international adoptions. Cold War Comforts offers insight into how women employed maternalism, nationalism, and internationalism in their work, and examines shifting constructions of family and gender in Cold War Canada. It will appeal to scholars of history, child and family studies, and social policy. Veronica Strong-Boag, Fostering Nation? 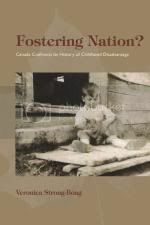 Canada Confronts Its History of Childhood Disadvantage (Waterloo: WLU Press, 2010). Fostering Nation? Canada Confronts Its History of Childhood Disadvantage explores the missteps and the promise of a century and more of child protection efforts by Canadians and their governments. It is the first volume to offer a comprehensive history of what life has meant for North America’s most disadvantaged Aboriginal and newcomer girls and boys. Fostering Nation? breaks much new ground for those interested in social welfare, history, and the family. It offers the first comprehensive perspective on Canada’s provision for marginalized youngsters from the nineteenth to the twenty-first century. Its examination of kin care, institutions, state policies, birth parents, foster parents, and foster youngsters provides ample reminder that children’s welfare cannot be divorced from that of their parents and communities, and reinforces what it means when women bear disproportionate responsibility for caregiving. Karen A. Balcom. 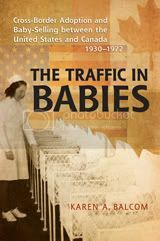 The Traffic in Babies: Cross-Border Adoption and Baby-Selling between the United States and Canada, 1930-1972. (Toronto: University of Toronto Press, 2011). 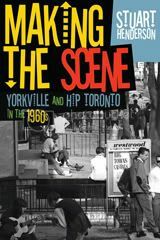 Stuart Henderson, Making the Scene: Yorkville and Hip Toronto in the 1960s (Toronto: University of Toronto Press, 2001). Making the Scene is a history of 1960s Yorkville, Toronto's countercultural mecca. It narrates the hip Village's development from its early coffee house days, when folksingers such as Neil Young and Joni Mitchell flocked to the scene, to its tumultuous, drug-fuelled final months. A flashpoint for hip youth, politicians, parents, and journalists alike, Yorkville was also a battleground over identity, territory, and power. Stuart Henderson explores how this neighbourhood came to be regarded as an alternative space both as a geographic area and as a symbol of hip Toronto in the cultural imagination. 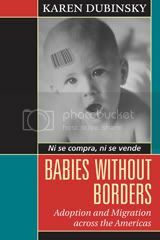 Karen Dubinsky, Babies Without Borders: Adoption and Migration Across the Americas (Toronto: University of Toronto Press, 2010). International adoptions are both high-profile and controversial, with the celebrity adoptions and critically acclaimed movies such as Casa de los babys of recent years increasing media coverage and influencing public opinion. Neither celebrating nor condemning cross-cultural adoption, Karen Dubinsky considers the political symbolism of children in her examination of adoption and migration controversies in North America, Cuba, and Guatemala. Drawing from extensive research as well as from her critical observations as an adoptive parent, Karen Dubinsky aims to move adoption debates beyond the current dichotomy of 'imperialist kidnap' versus 'humanitarian rescue.' Integrating the personal with the scholarly, Babies Without Borders exposes what happens when children bear the weight of adult political conflicts.